← Tombé pour l’euro ? 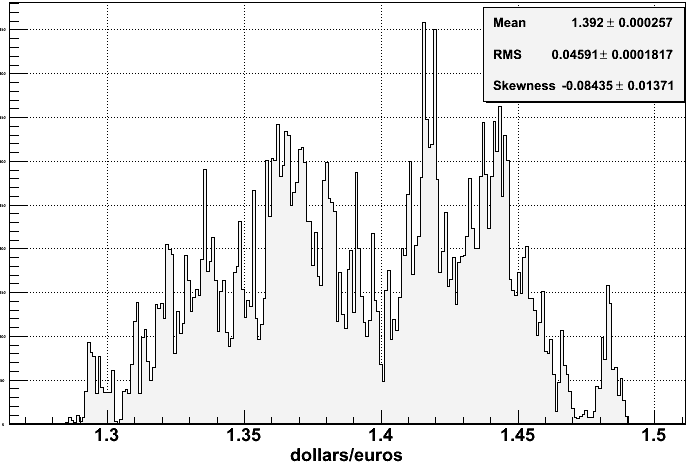 The first point in my data set is 1.394400 $/€, the latest is 1.357997 ; a difference of 0.0364 or -2.61 %. Quite a loss, even if, were it not for the recent drop, the balance of up and down would have been null. Over the year, the average exchange rate was 1.392 $/€, with a dispersion of 0.045, a dispersion that is spilling on the lower side (negative skewness). 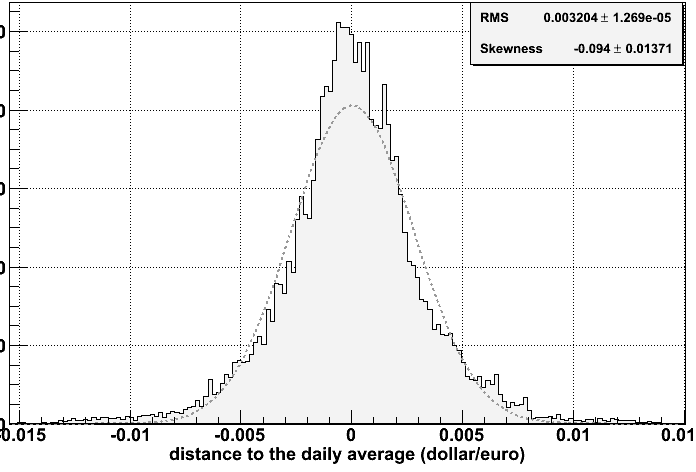 If we look at the spread of each value around each day average, the standard deviation is 0.0032 dollar/euro, with a slight tendency to go to the lower values (negative skewness again). One might try to fit a gaussian distribution (pointed line), with a correct but not perfect outcome : the distribution is broader at larger values and tighter at the center. The day to day change in the daily average value is zero in average, but is clearly skewed to the negative, hence a regular drop in exchange rate during the year. 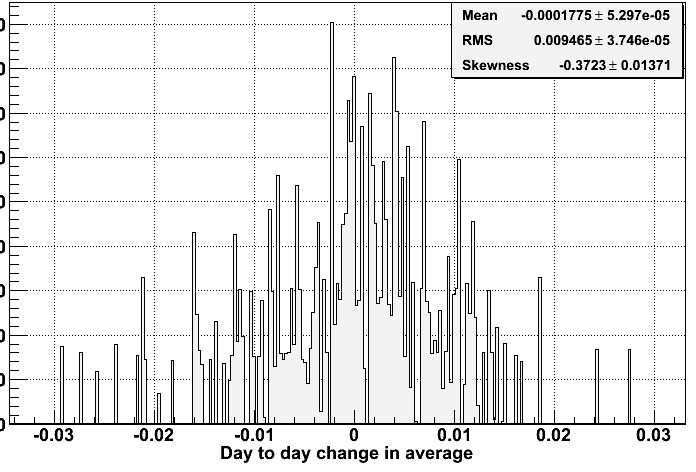 Furthermore, the day to day change is often greater than the daily dispersion of data, this implies that the natural variation during the day are smaller than global variation over several days. 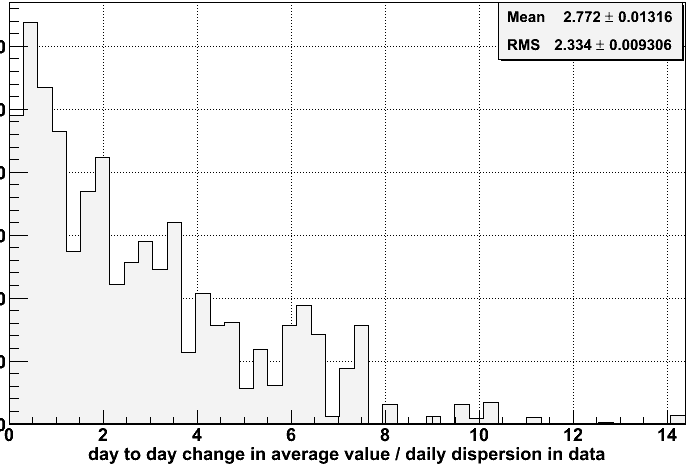 Without surprise, there is a correlation between large daily variation and large day to day change in value, but with only a 6% correlation coefficient. If you wish to investigate this data yourself, you can find the data set here – the format is “%m/%d/%Y %f” with first the date, second the euro/dollar exchange rate.